As winter turns to spring it’s time to talk about one of my favorite topics in collecting: the Toy Show scene. Each year thousands of fans make it to local shows and comic cons across the country. These events are some of the few face-to-face toy exchange events that still take place and they come in all shapes and sizes. You’ve seen me talk up toy shows before, whether it’s been looking at them as a destination for collectors or discussing their viability in an increasingly digital world, both literally and socially. The one thing all readers of these articles should take away is this: toy shows are one of the oldest and best ways to meet other collectors and find great items! Rather than talking about shows hypothetically this time, here I actually give you the information you’ve been waiting for, the secrets of where are the best toy shows are in the United States. For those of you not located in the contiguous 48 States we will revisit this topic globally in the next year, just for you. What Makes a Great Toy Show? As old as collecting itself, toy shows are one of the few original concepts in the hobby that exist to this day in its purest form, person to person. I’ve been fortunate enough to hit up over 40 shows across the country over the last several years. Each has its own personality, sometimes mundane and sometimes exciting, and always unique which can be good or bad. Regardless of the show and location one thing remains consistent across all shows, good buying and selling can offset anything -- be it rain, snow, sleet, below freezing temperatures, you name it -- and thus as I consider the traits that make up a great show, the buying and selling aspects are paramount to all other aspects of the show. Not to say that this is the be-all-end-all of having a good show, but this is the core driver that I see across all shows that I’ve attended. Other traits I looked at included the atmosphere (People and Place), is it safe, is it heated/cooled appropriately, is there food available, and what are the other people like at the event (both sellers and buyers), as these are the key ingredients in a good show. Other things like communication, registration, and administrative aspects of these shows are important too and considered when pulling together this list. Who’s Not on Our List? When it comes to looking at the best toy shows out there it’s tough to narrow down a list. However, to be fair to the local toy show (which is the focus of this article), we need to weed out and define what we would include in this list. This means we won’t go into detail on some of the best “events” for vintage toy collectors. These are broken into two categories: The Big Three and Franchise Specific Events. For those that aren’t familiar with the lingo the "Big Three" are New York Comic Con (NYCC), San Diego Comic Con (SDCC), and New York Toy Fair (NYTF). It’s an industry term as these are a few of the events that major toy manufactures and studios attend. Thus, corporate sponsorships reach in the multi millions of dollars for extravagant booths and set-ups to unveil the future of toys. These are some of the largest events in the realm of comics and fantasy in the world. Each are chocked with vendors including all the big toy manufactures and studios, everything from Gentle Giant to Mattel, Warner Bros to Disney. These events have become bigger than anyone ever expected. For that reason we won’t really use these events for comparative measure in this article. Albeit, you can find vintage toys at these events and you can get exposure to a lot of great things that are happening in the industry, from new toys and movies to all things in between. Unfortunately the core focus of these events has turned more towards corporate pageantry and less towards home-grown interaction with fans. Another category of events I left off the list will hit home with fans of certain franchises, as they are monotone in what fan’s they serve. These we call are the Franchise Specific Event like Star Wars Celebration, Joe Con, TF Con and many others. It pains me to not include them as I do think that each are the epitome of opportunity to buy, sell and trade with others in their respective hobbies. But because of their inconsistency in location and schedule and the fact that they really hit on one specific line in the broad spectrum of popular brands, they'll be left off this list. For the most part, toy shows are once a year types of events, but in some cases like Kane and Columbus they are bi-annual with a show in the spring and the fall. When it comes to our next show on the list, no others come close to delivering the pure number of events and consistency of these events occurrence to occurrence. ToyMan is a collective series of bi-monthly shows based in St. Louis, Missouri. Seen on one the first seasons of Toy Hunters, it’s a bit of a fabled event in the annals of toy collecting, with special appearances (announced and unannounced) and a casual environment that is a welcome change from the hustle of more fast-paced and larger shows. While small in over all scope, you have to appreciate the ongoing efforts put out by the shows organizers and vendors. Every event is treated like it’s a once a year event, the vendors consistently turn out great items across vintage and modern toys across the spectrum of brands and toy lines from the past 50+ years. Go for: central location (Total U.S.), friendly collectors and sellers, and lots of new inventory show to show. Beware of: your surroundings while traveling to the show, while not in the worst part of town, it’s not far away from some rough areas of East St. Louis. One of the longest running independent comic cons in the country, Motor City Comic Con is a unique event with a character all its own. With the feel and advantages of big scale events while still offering a very localized and inviting atmosphere, MCC is one of the few con-style events to make our list. Much like Steel City, this is one of the most toy-rich con-style events out there, with buying options from the typical con-based comic book categories. Go for: Great fun atmosphere. Just like any big con out there, there’s a lot to do and see. Beware of: Costs. Although an independent event, going to MCC can have a rather large price tag attached to it if you’re not local. Buying can be hit or miss, but the hits outweigh the misses. One of two shows that CTS Promotions runs each year, and nestled right in the heart of Kenner country, Columbus has become one of the better shows for vintage and modern toys on a national scale. The event itself is accessible, large and is simply one of the best shows in the country for buying and selling toys. The amount available and the diversity of the product is what sets this event apart from other shows out there. Go for: Great buying, great trading and a fun atmosphere. The promoters try and bring some fun elements without going out a limb and having 4 fudge booths, but that’s another story for another time. Beware of: Competitiveness. There's a sense of territoriality among a lot of the collectors from the local market. Also, no matter how hungry you are don’t stop at the McDonalds near the building, just trust me on this one. There are shows that are legendary because of one time occurrences, like a rare set of figures popping up. There are shows that are legendary because of the attendees and stories that come out of them, and then there are shows that extend beyond that, and Kane County is that show. Kane County is one of the longest running shows in the hobby, and it has a strong track record that goes along with that. Whether it was the sale of carded Uzays, or just a set of 12 backs, some great things have turned up over the years at Kane. 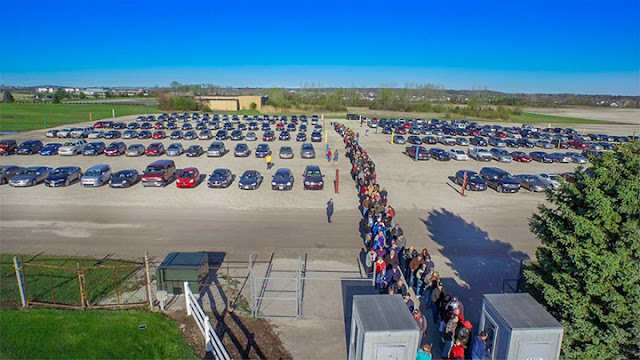 While some shows have great buying and selling, good facilities, and are well organized, the Kane county toy show takes it a step further by really focusing on the buyer -- you know, the thing that keeps these events being successful. Whether its early access badges, the ease of use of the site, or the accessibility and demeanor of the promoters, it’s just fun across the board. Adding to the event is the simple fact that it’s in Chicago, one of the few major markets in the US with a central location and generally easy access for most travelers. Go for: Great buying, great trading, fun atmosphere, good people, nice promoters, and generally a great, but exhausting time that also helps you get in an extra 15,000 steps that day. Beware of: Scale -- It stretches beyond just one building and weather becomes a factor. Remember that Chicago in the fall and spring is fairly brisk, and rain can be a damper on your time when carrying around old cardboard boxes. And there you have it... a short list of some great shows to attend, and four that need to be on everyone’s bucket list. Agree with our list? Did we miss something? Comment below and let us know what your favorite event is, and share your stories!